Here’s a recipe with maximum flavor for minimum time in the kitchen. 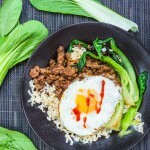 Thai Beef Bok Choy Rice Bowl with an egg on top. YUM! A quick and delicious dinner in 20 minutes. I can finally say that I’m ready to take a break from braising and roasting – at least for a bit. The sun is shining here in Boston and there are only a few inches of snow left on the ground. After a long grueling winter, the first sunny days of spring are pure happiness and joy! Here’s a delicious recipe for you with a bright sunny egg on top, that will allow you to spend minimal time in the kitchen and enjoy maximum happiness and joy at the dinner table. The rice bowl concept is one that I love: a well composed assortment of wonderful ingredients – a mini smorgasbord – all tucked into one little bowl. 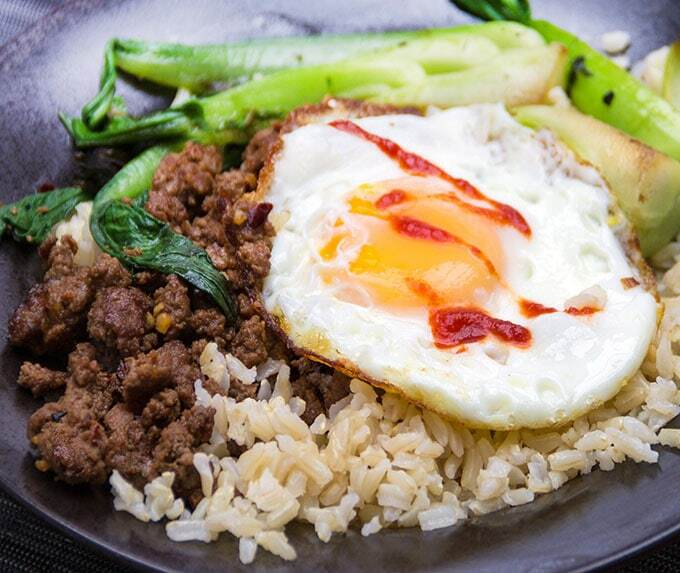 The ground beef is the nucleus of the dish – with all the intense flavors of soy sauce, sugar, chili paste, and garlic. The fresh bok choy and rice are healthy and great alongside. The crowning touch is the fried egg on top. If you like heat, as I do, add a splash of Sriracha. 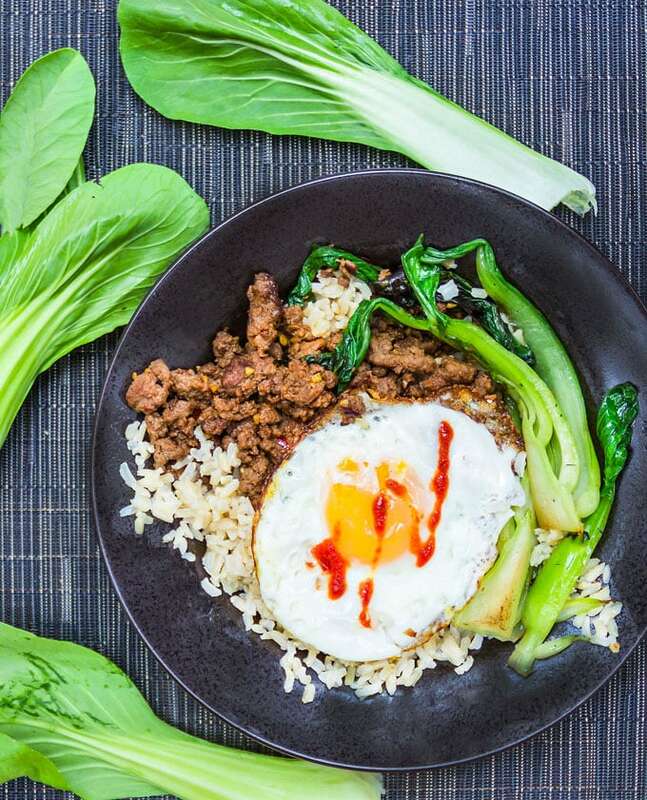 Here’s the recipe for the Quick Thai Beef Bok Choy Rice Bowl. If you try this, I hope you’ll come back and leave a comment. I’d love to know what you think. A quick and easy stir fry with Thai flavors. Note: Make the rice ahead or reheat 2 1/2 cups of leftover rice. Make the Sauce: Whisk the sauce ingredients in a small bowl. Set aside. Cook the Stir-Fry: Heat a large cast-iron skillet or wok over high heat. Add 2 teaspoons oil; swirl to coat. Add the beef to pan. Stir-fry 2 minutes or until beef is no longer pink. At this point I like to briefly remove the pan from the heat, tilt it, and spoon out some of the rendered fat from the pan but this step is optional. Add the sauce to the pan. Stir-fry for 30-40 seconds. Scrape the meat mixture into a bowl and tent with foil to keep warm. Add 1 1/2 teaspoons oil to pan. 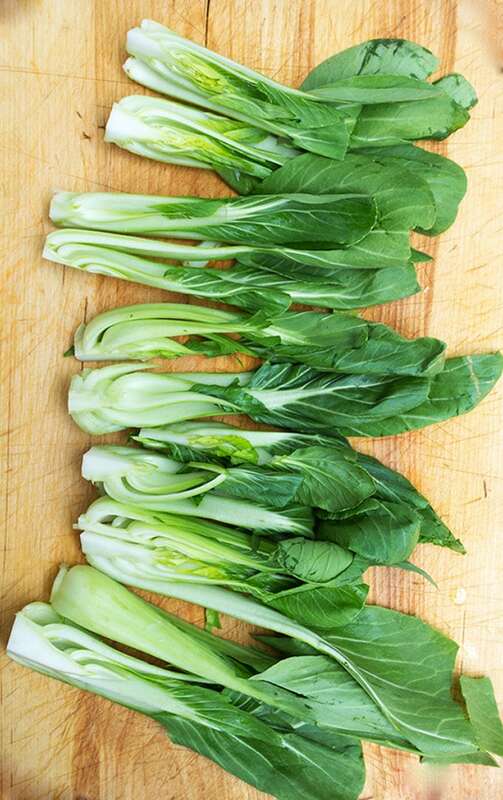 Add bok choy and stir-fry 2 minutes or until crisp-tender. Place on plate with beef. Tent with foil. Wipe pan clean with a paper towel. Heat remaining 2 1/2 teaspoons oil in pan over medium heat; swirl to coat. Crack eggs, 1 at a time, into pan; cook 2 minutes. Cover pan, and cook 1 minute longer or until the whites are set and eggs are cooked to your liking. Divide rice, beef, and bok choy among 4 bowls. Top each bowl with a fried egg. Serve immediately, garnished with Sriracha, if you like. Super yum and easy! I made it with kangaroo mince and baby spinach (thought it was bok choy)! This was so good and easy!! I used Kale instead of bok choy because I had to use it up. Thanks! A little late to the game, but I just found this recipe online. I loved it. It lends itself well to prepping ahead of time. I already had leftover rice and browned ground beef in the fridge, made the sauce the night before. It took only a few minutes to complete. Asparagus is also a great veggie to use with this recipe. Looking forward to making this again. Delicious! Kids even asked for seconds! I am excited to try this. Do you think Thai Curry Paste would be a good substitute for the Chili Paste? I think curry would add a different flavor, but it might be good! I’d be tempted to give it a try. If you do, I’d love to know how it turns out. Wow – this was so so good. Flavors in the beautiful sauce were spot on. Served over steamed jasmine rice and it was such a hit – we could not get enough!! Thanks so much for an awesome recipe that will be part of our menu rotation often!! This looks great! I love breakfast meals; we’ll have to try this one! This recipe is so. good. It is definitely going into my favorites folder. It looks very impressive even though it is so easy especially since I added a few slices of avocado and some pickled red onion I had in the fridge as a garnish. I didn’t have any thai chili sauce, although I’m sure it i even better, so I used sriracha and increased the fish sauce by 2 teaspoons to approximate and it was delicious. Thanks for this recipe! It’s the easy sauce that catches my attention. I have to give that a try. I like making my own sauces, because you can tweak them a bit to suit your own taste or not. It sounds Ta Ta if you make your own sauce. And of course life is all about your image. You know I am teasing here. I like rice bowls and I love bok choy—-works for me! I don’t normally talk about ME, but take note of the slight name change from Wild Goose Tea. New web site design too–whoopee and I will be adding some new features. Mmmm – delicious Lisa – wish I had this recipe last night – I look to do something interesting with mince (ground beef) last night and this would have been perfect – thanks Lisa. I can’t wait to make this! 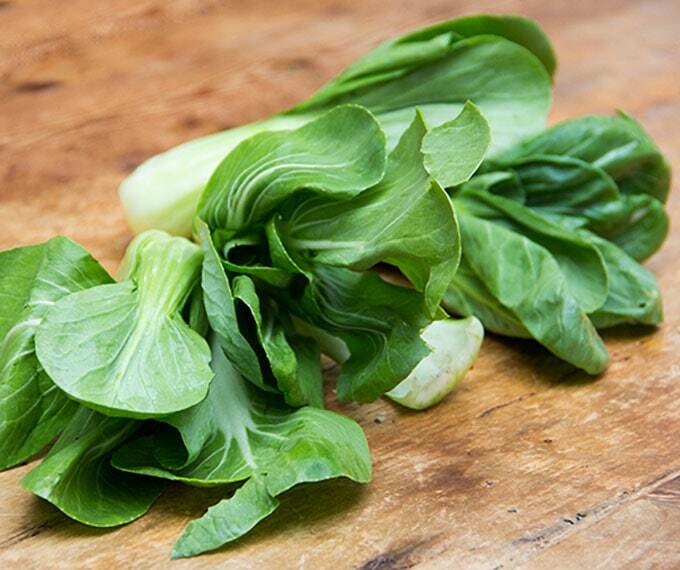 Can you recommend a substitution for bok choy? My local grocery store rarely carries it. Thanks! I like this . Looks easy. I need to learn how to use these sauces to reproduce the Asian flavors. Hi Krishna, Thanks for your comment. It is an easy dish. Let me know how you like it if you try it out.